I am admittedly not a great “pill taker”. By that I don’t mean that I have trouble swallowing them but I have trouble remembering to take them at the same time of the day every day. You would think that I would be awesome at it, because I have had to take a pill for my thyroid my entire life, but truthfully I have always struggled with it. I have tried several things that have been somewhat successful, like keeping my thyroid pill bottle in my car, so as soon as I get in the car to go to work I see it and take my pill. That works great, until the weekend when I don’t necessarily get in the car in the morning. I have also tried keeping it in the bathroom, but will all the other stuff cluttering my counter; the bottle would get buried or stuffed in a drawer….and out of sight out of mind unfortunately. For the past few years I have been pretty good about taking it at the same time consistently which has been a major win for me. Well…..now with all the added supplements and extra medicine that I have to take on certain days, at certain times….I am screwed. Especially since a lot of what I am taking shouldn’t be mixed with other things. Oh, and in addition to all the extra pills (especially on cycle day 3-12), my primary doctor just changed my thyroid dosage. I have to take one dosage Monday-Friday and a different one on the weekends. This makes things even more difficult to keep track! 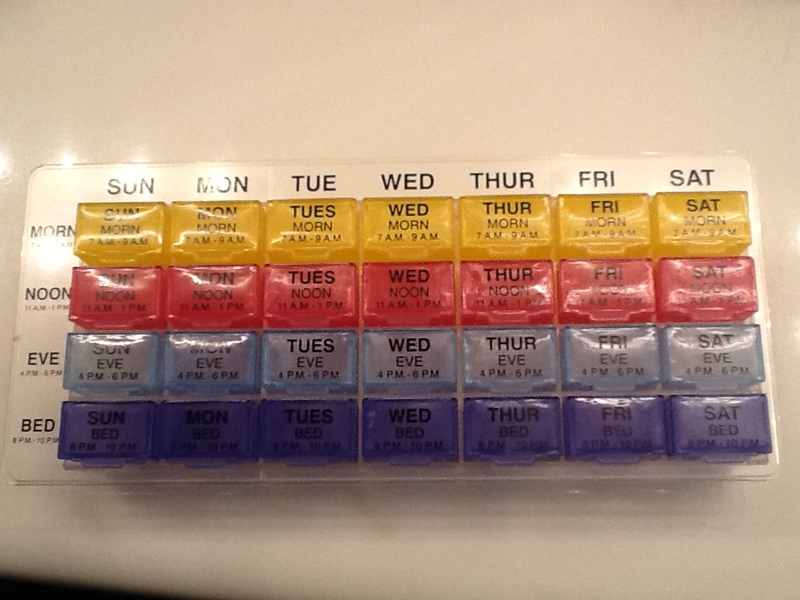 For the record I have been awesome about taking all of my prescribed pills every day as required. Not one miss. What does seem to get missed is my supplements, because they have to be taken at odd times so they aren’t mixed with the actual medication. So I finally broke down and got 4x a day pill box. I feel like an old lady using this thing, but it has already helped so much. You can actually pop out the boxes and take them with you, which is pretty awesome, and they are super deep so they can actually fit my big calcium chews. It is also awesome when I travel that I won’t have a huge bag of pill bottles. I can just take the boxes I need which will take up a lot less space! The end of last week really sucked. After my not-so-wonderful experience with my clinic on Thursday my drive home (which is about 130 miles), took four and a half hours. There was one complete hour that I only moved 9 miles. By the end of the drive, even though I was finally able to go 70 mph, I was in tears. Sobbing. And completely freaking out about the “what if this doesn’t work and I never get pregnant” I have never let myself get there. To that place where I really let myself thing/believe that it is impossible for me to have a child. Yes I completely realize that two years and two IUI’s is nothing in the scope of infertility. Unfortunately it was the perfect storm on Thursday and after hours in traffic I was mentally and physically exhausted. A perfect time for my emotions to take over. When I finally got home I was a zombie. I felt horrible because obviously I hadn’t seen my husband since Monday, and he was leaving the next day for the weekend. But I just couldn’t. I took a bath, and we watched a few of our taped shows but I just couldn’t talk. At all. And after all of that I started Friday with a migraine. Thankfully I was able to kick it fully by noon, but I was not myself all Friday. I started my Letrozole on Friday night. My RE actually upped the dosage from 5 to 7.5. No explanation was offered to me to explain why he decided to do that, which is annoying. I spent all of Saturday with my Step son and babysitting my friend’s little girl who is two. Sunday was a day for me. My husband was gone in SoCal, and I spent the day reorganizing my closet. It was amazing. I still have a few things left to organize, but it’s a million times better than before. It had really gotten out of control. It just makes me feel better to see it in order. Being able to walk in and actually see everything is amazing. Today I am wearing a shirt I forgot I even had! It was a great way to start the week, and today I am much more relaxed. Of course since I spent pretty much all day doing the reorg, I did not go grocery shopping, so that is on the list for after work today.